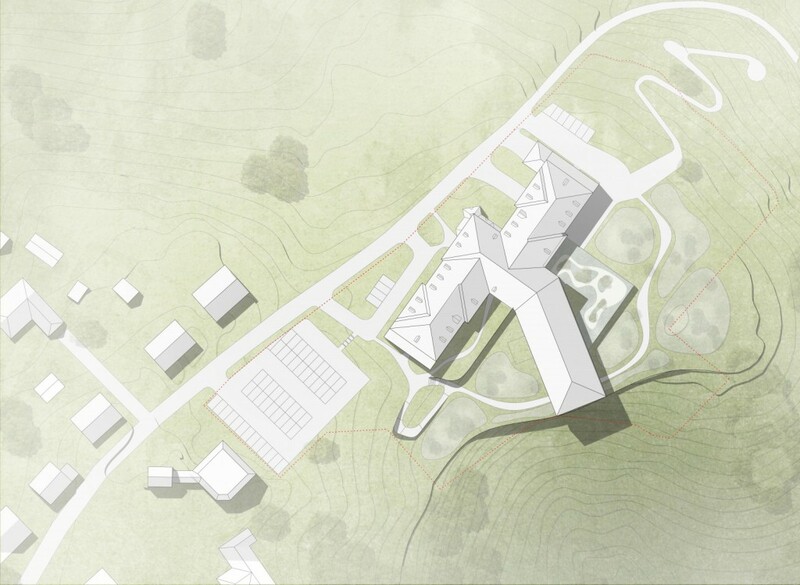 The site for the new construction at the Lembach district elderly and nursing home is distinguished by its unique views over the surrounding landscape and the quality at the green space. Allowing this special, location-specific setting to flow into the architecture of the addition was one of this project´s guiding principles. The existing building, which is situated on the edge of Lembach and accessed via the Lederergasse, will be expanded with an extension similar in height and proportions to the central structure of the present facility. The addition will be attached to the current hub and central circulation core. To achieve optimal patient room orientation, the wing bends southwards toward the slope and runs in harmony with the contours. On the basement level, an indented plinth will be built and serve as a garden floor with direct access to the sun deck.